When You Display at our Two Conferences! Current Corporate Members Must Log In For Correct Pricing! Up To Date Event Agenda! 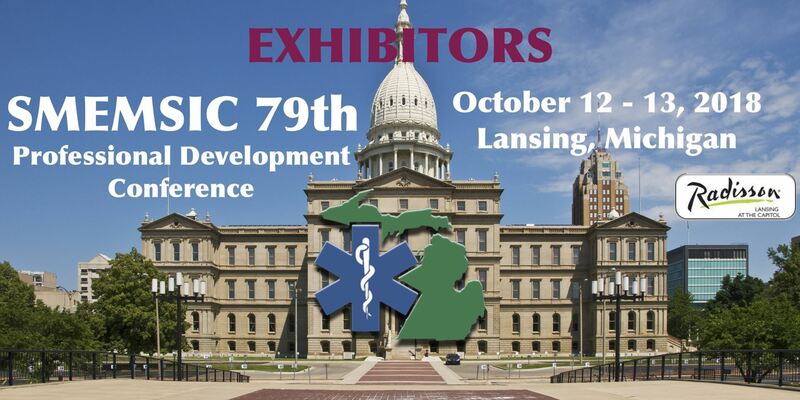 We invite organizations to exhibit at the Society of Michigan EMS Instructor Coordinators' 79th Professional Development Conference. The conference will be held October 12 - 13, 2018 at the Radisson Hotel & Conference Center in Lansing, Michigan. A large exhibitor area is located near the main conference room and conference attendees will be taking their breaks in or near the exhibitor area. You will have an opportunity to meet with EMS Instructors from Michigan who are the leaders in EMS organizations and communities throughout the State. Exhibitors may choose to sponsor a break, keynote speaker or donate a door prize. Each level of sponsorship offers the opportunity to promote your company to the EMS leaders attending the conference. Friday, October 12 any time after 7:00 AM. First break for the conference is at 10:00 AM. Saturday, October 13 after lunch. We are once again in our State's Capitol at the Radisson Hotel Lansing at the Capitol. There is a limited block of rooms being held for our conference. Click their logo below to reserve your room. You can also contact them directly if you prefer.